It is not very uncommon that the car and bike owners do something extraordinary to show their displeasure at the automakers and also to draw their attention. But, Italian businessman and serial BMW owner Pourmohseni Hadi has gone one step ahead with his repeated acts of destroying BMW cars and his latest victim is a BMW 7-Series. 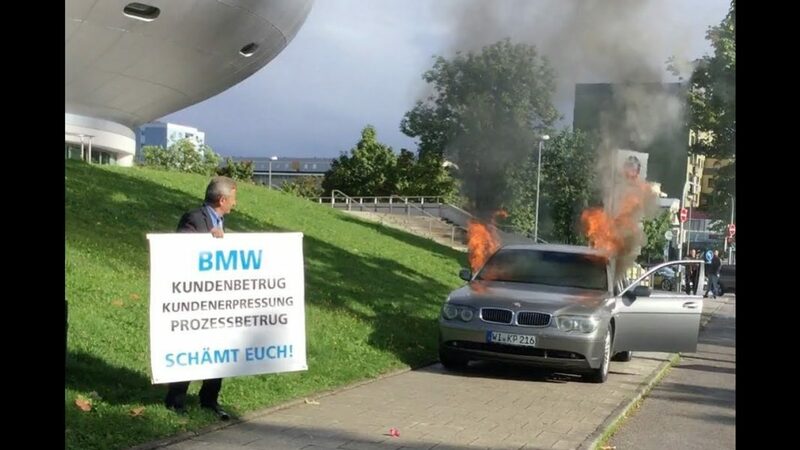 In 2015, Pourmohseni Hadi burnt a BMW Z3 and the 7-Series was the last addition in the list. As the Italian businessman says, he has been complaining about his BMW M6 having troubles like rattles and transmission shifting issues. But, the company didn’t respond to his complaints and the dealers he approached dismissed his concerns. This is why Pourmohseni Hadi has been on a mission for quite some time to destroy the exotic BMW vehicles he gets his hands on in order to get the attention of the German auto giant. However, the automaker doesn’t seem very concerned about such acts by the Italian man and yet to respond. No wonder, the Pourmohseni Hadi has chosen this way of protest after being disgruntled by the trouble he has been facing with his BMW M6 and by the repeated denial by the automaker and dealers. But, will these acts of destroying the luxury cars really be helpful for the man to draw attention of the company? What do you think about it and have you ever faced such situations when the automaker has turned a deaf ear to your concerns? Let us know by commenting.